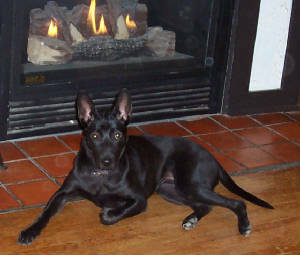 She is our Black female TRD and is the newest member of our family and Hannah's daughter. 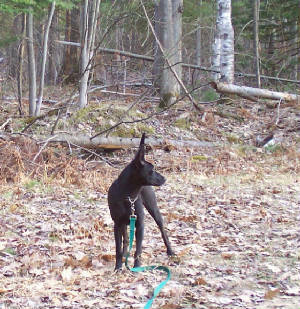 She was born December 7, 2004 from a litter of seven . She is turning out to be a carbon copy of her mother. She has a very typical TRD personality except for being reserved, like her mom she loves just about everyone she meets. She loves her mom and spends a great part of the evening playing with and trying to win at tug of war or who can get the bone first. She will curl up beside Hannah in front of the fire and she looks like she has found heaven. 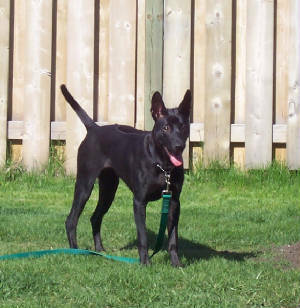 She is fun loving, a bit bossy, and all Thai Ridgeback. She will be shown in the local Rare breed shows and hopefully will have more interest in them than her mother. We will also train in Schuthund with the focus being on tracking and obedience with the hopes of earning some junior championships this summer. Like her mother it seems tracking will be her thing. She has already started at this younge age and spends most of her time with her nose on the ground. 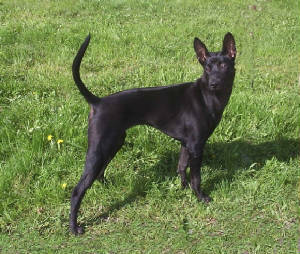 My goal for her is to become the first thai ridgeback champion in tracking and obedience winning as many titles as we can. Chai has a very loving, warm and endearing personality and lights up any room when she enters it. She absolutely shines and has made her way into our hearts in a very short amount of time. Like her mother she is loved by all who meet her.